Manages health services activities. Plans, develops, manages, and performs health services activities. Related DoD Occupational Subgroup: 340. Performs and directs patient management functions. Interprets communications, directives, and publications. Coordinates release of information functions. Prepares health record copies and abstracts. Coordinates release of information functions. Prepares, files, safeguards, transfers, and retires health records. Maintains patient locator and suspense files. Prepares, codes, and transmits clinical record cover sheets. Transcribes daily information onto charts. Transcribes physicians' orders, and prepares requests for diagnostic tests, consultations, and referrals. Performs functions to admit, discharge, and transfer patients. Compiles information and prepares reports, graphs, and charts on bed occupancy, staffing, dental health, medical care from civilian sources, and professional activities. Prepares patient-related correspondence and special orders for patient assignment, reassignment, and aeromedical evacuation. Coordinates and prepares forms. Identifies and processes Line of Duty (LOD) determinations. Monitors dependents education (overseas clearance) program. Identifies, coordinates, and processes medical conditions requiring Medical Evaluation Board (MEB) proceedings. Verifies patient eligibility. Performs procedures for network referrals. Provides claims assistance and counseling to beneficiaries. Performs and manages resource management functions. Prepares financial statements and subsistence stock records. Compiles information, subsistence accounting, and prepares statistical reports. Performs market analysis and business case analysis. Coordinates third party collection (TPC) activities and prepares necessary reports. Assists in manpower surveys and developing manpower standards. Identifies manpower standard exceptions and deviations. 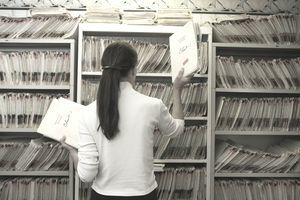 Screens medical records to gather data for medical audits. Analyzes workload and cost data to validate manpower requirements, and develops adjustments and projections to support clinical or mission changes. Monitors the Unit Manpower Document (UMD) to ensure requirements and funding are accurately reflected. Monitors the Unit Personnel Management Roster (UMPR) to ensure correct assignment of personnel resources. Identifies personnel staffing shortages and coordinates permanent or temporary assignment actions. Collects, maintains, prepares and analyzes Medical Expense and Performance Reporting Systems (MEPRS) data or comparable workload accounting system. Prepares budget estimates and financial plans. Monitors expenditures and obligations; analyzes financial reports and accounting and workload reporting procedures; conducts studies and internal audits. Performs and manages medical information technology functions and activities. Requests and documents technical assistance. Manages hardware and software activities. Monitors information technology security programs. Performs customer support activities. Manages user-training programs. Knowledge. Knowledge is mandatory of general clerical procedures; medical terminology, regulations, and directives; medical ethics; health records administration; principles of coding; and anatomy and physiology. Education. For entry into this specialty, completion of high school or General Education Development equivalency computers is desirable. Training. For award of AFSC 4A031, completion of a basic health services management course is mandatory. 4A071. Qualification in and possession of AFSC 4A051. Also, experience supervising a health services management function. 4A091. Qualification in and possession of AFSC 4A071. Also, experience managing a health services management function and personnel. Other. For award of AFSC 4A031, ability to keystroke at a minimum speed of 20 words per minute is mandatory. Required Appitude Score : G-43 (Changed to G-44, effective 1 Jul 04).